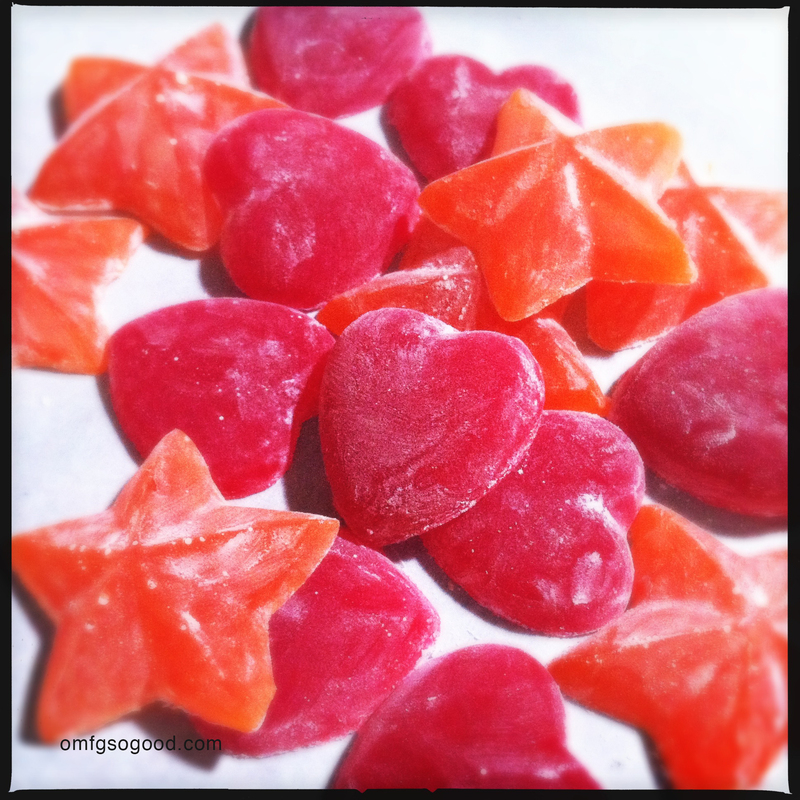 homemade gummy candy | omfg. so good. IT’S A CHEWY-FUL WORLD. For you, so chew, so chew. Now I can only hope at least one of you is a Devo fan and caught on to that song reference. Just a little preface to the recipe. These are extremely gummy gummies. Chewy to the maxx. The recipe below is for one batch of a single flavor. We doubled it up to double the flavors. Empty jello and gelatin into a medium saucepan. Mix in the water, being careful not to get any of the mixture up the sides of the pan. Let the jello/gelatin and water sit for around 10 minutes, then move to the stove and bring to a boil over medium heat. Reduce heat and simmer for around 5 minutes or until gelatin/jello is completely dissolved. It will get thick, so don’t freak out. Remove from heat and let cool for just a few minutes then transfer into a glass measuring cup or other heat proof container that will be easy to pour from. 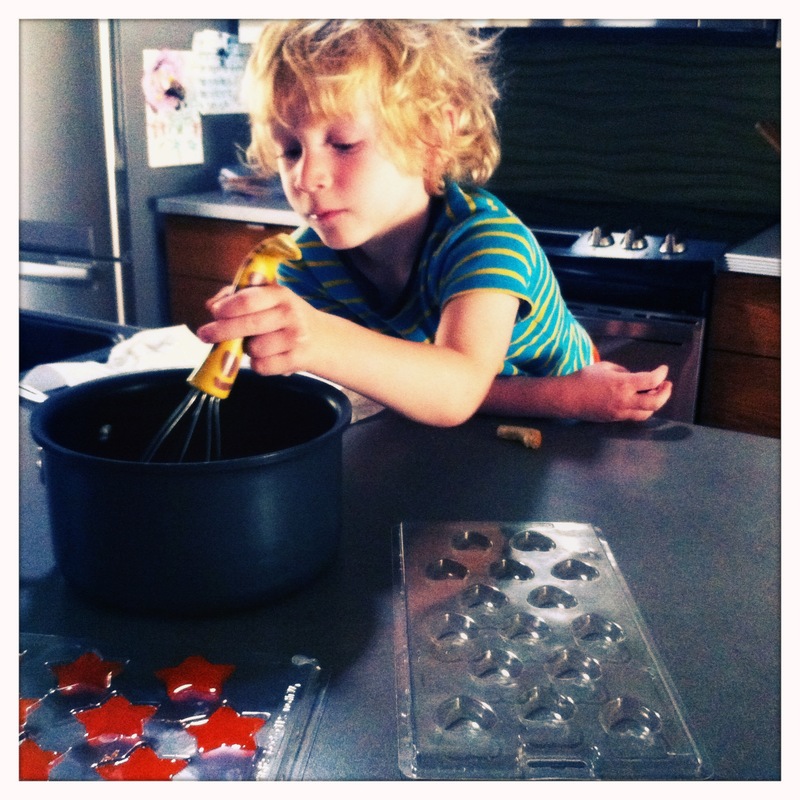 Carefully pour into candy molds. DO NOT SPRAY THE MOLDS WITH COOKING SPRAY. THEY DO NOT NEED TO BE GREASED. 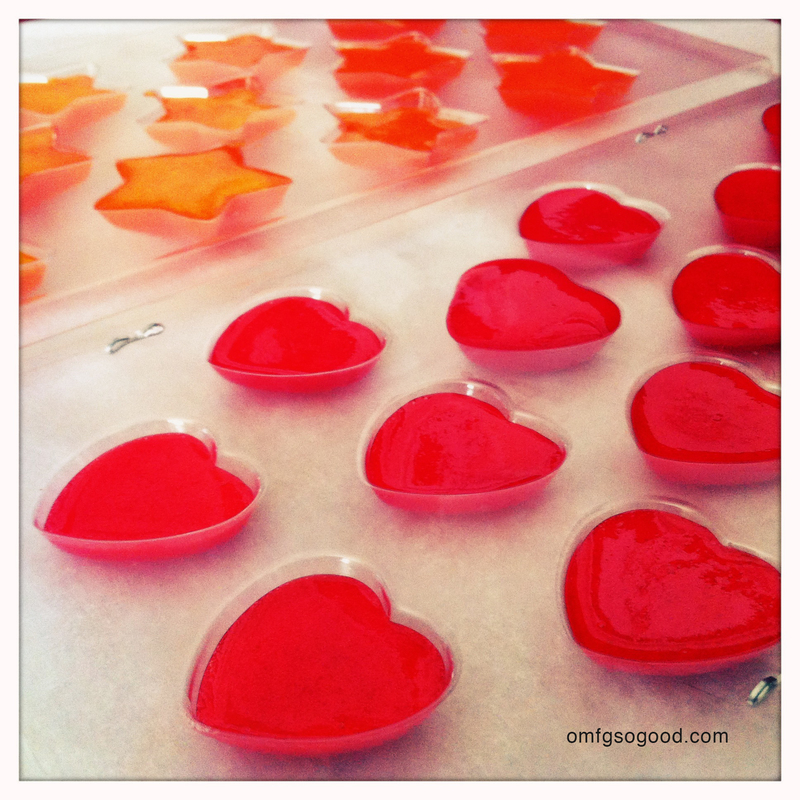 I bought the heart & star candy molds from Michael’s for just over $1 each. If you have other shapes they will work just as well, just use molds with small cavities. Remember, these are extremely gummy/chewy so larger molds might prove to be gummy overkill. Meanwhile, prepare the dusting bag by adding the cornstarch to a large ziplock bag. Once the candies are set, use your fingers to pull the edges away from the molds, pry the candies out completely. 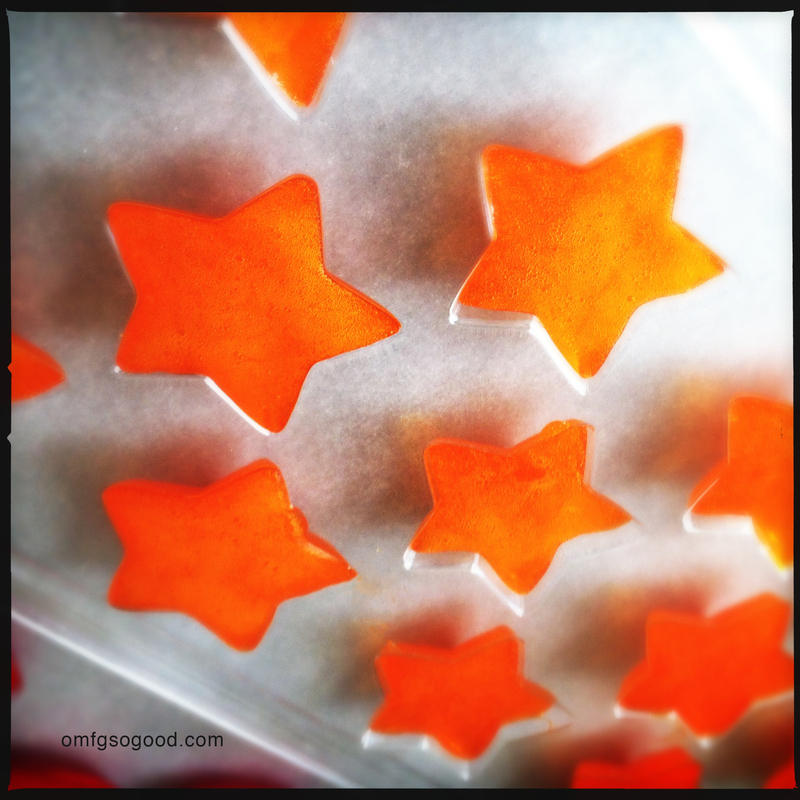 They will be pretty sticky, which is why the next step is key. Drop them into the prepared ziplock bag and gently shake to coat them with cornstarch. And, there ya have it. Gummy Candy, home brewed. Could you use a 8 by 8 pan and just cut it into squares or something? Have you ever tried with using real fruit juice? How much of juice with gelatin would you use? I have been wanting to make extra chewy gummy candy with real fruit juice, but it’s never as chewy as I would like. Any suggestions? I’ve never tried making them with fruit juice, but I’ve seen other recipes that sub juice combined with sugar for the flavored jello. From what I can see it’s a 1/3 cup juice to 3/4 cup sugar ratio. If you try it, let me know how they turn out! wow!!!! these look great. so they are super gummy because that is what I am looking for but they are never to my liking but these just may work out! Its nice to see your blog is still active. I just wanted you to know that I have tried, what seems like, a gazillion gummy recipes and this right here is freaking it! Perfect consistency, tastes delicious. If anyone is reading this comment, this recipe does not taste like jello, but not as hard as a gummy. It truly is perfect and delicious. If anyone is interested in adding anything infused like coconut oil, it can be done with this recipe. I added 48 grams of infused coconut oil (essential oils used were lavender, bergamot, vetivert), I tsp of vegetable glycerin and worked like a charm. I’d love to work with this recipe and change out the jello at some point for fruit juice but its hard to mess with greatness. Oh…I also added about a 1/3 cup of sugar to help absorb the coconut oil. I got a lot of high fives in this house thanks to this gem of a find!! Thank you!! So glad you’re still following, and have had such smashing success with our gummies! Love the idea of adding oils, will definitely try this at our house. 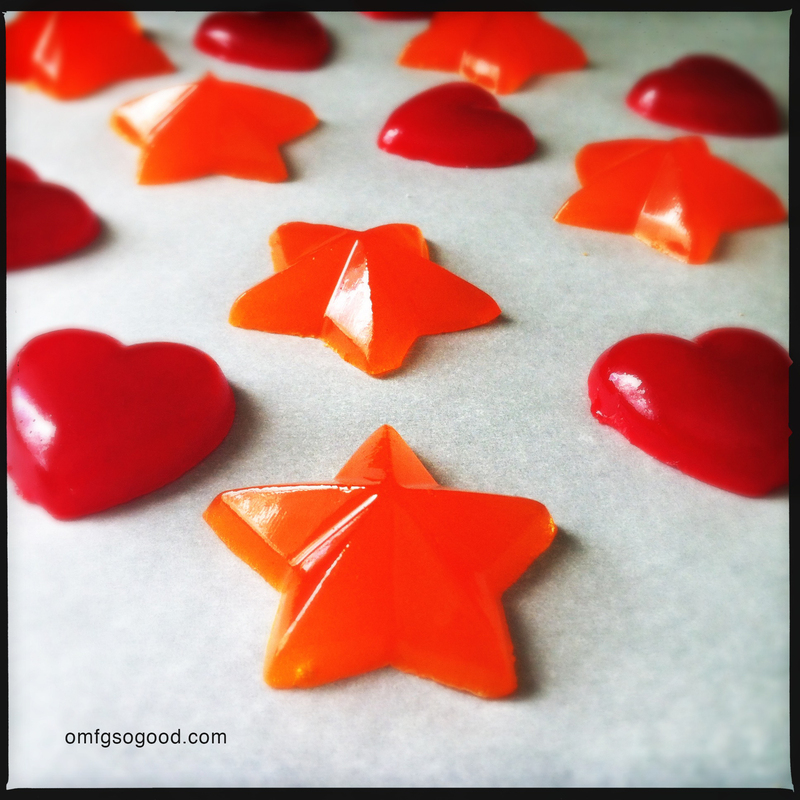 Just curious if you have ever added cinnamon oil to make red hot cinnamon gummies? I am wanting to try some for Valentines Day. I just made a batch using fruit juice and although the taste was good, the consistency was definitely like jello. Going to try your recipe but was unsure what flavor of jello to combine with the cinnamon. If you have any suggestions, please let me know. I would use unflavored jello, or possibly cherry if you were going to add cinnamon oil. I’ve never tried it, but it sounds like it could work well!